Yesterday, in honor of the creativity challenge, I decided it was time to re-tackle the awful purse project I have scattered across the sewing table. It’s been sitting there for a good couple of months and since then I’ve managed to make another purse rather than face all the cut out bits that lie in wait with their incomprehensible instructions. My goal was to have the main part of the purse completed by the end of the day. I’m proud to report that after staring at the thing for a few hours, I’ve managed to successfully construct the sides of the purse, but unfortunately the step that followed baffled me for several more hours and I wasn’t able to go any further (basically, it’s how you create the corners, which I know how to do on the purse and messenger bags I’ve made in the past, but this is completely different and it blew my little mind until I decided to use my mind to visualize what they were actually doing). Thankfully, today I have Jay, who is one of those people who excel at learning through reading (I’m more a learning through doing sort, especially when facing a pattern, who despite a name which implies “Simple” should consider changing it to something more descriptive like “NotForNovicescity”. I mean honestly, to claim “Simple” they should have a pattern that’s nicely color coded, one that makes smaller logical steps verses “and then you sew side 2 and 3 together and you have a purse with pockets and a catch, tada!” – maybe even hire a real technical writer – not some guy whose process paper on “How to Make a Peanut Butter and Jelly Sandwich” read something like “take two pieces of bread, spread on toppings and voila! sandwich” – and I’d like a YouTube link to a video of a friendly elderly woman who slowly walks you through the pattern or maybe a hotline where a crafty person would answer and then show up at your door, pat your hand and encourage you through the next steps with kind words and freshly baked cookies – this wouldn’t be just for me, but for all the beginner sewers who were drawn in by the name “Simplicity”). I’m also going through a phase where I think I may hate the fabric – at least when it comes to this purse, which could have to do with me now officially hating the actual purse design. When I first bought it, I thought “fun”, but now it’s moved more to “dopey”. The fabric is kind of a Día de los Muertos (Day of the Dead) themed print and the only hope I have for the fabric now is that there’s enough left over so that I can make a different purse. So, there you have it Day 2 AND 3 (see, the writing stuff counts) for the June Creativity Challenge. This entry was posted in June Creativity Challenge, Projects. So, yeah. At least I can make brownies. “…I didn’t buy bias fabric” – ok, you made me snicker a bit. Go DeAnne! 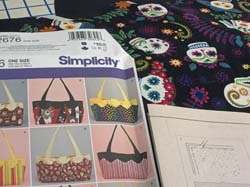 The purse is almost recognizable – there are handles and things and it’s purse shapped, but there are big glaring flaws. I’m currently pretending I can’t see them.